Abrams’ wide-ranging interview on Morning Joe included a rousing defense of identity politics, measured critique of recent accusations against Joe Biden’s inability to keep his hands to himself, and a candid assessment of her political future. What’s clear is she’s doing all of it on her own terms, on her own timeline, and using her own instincts. 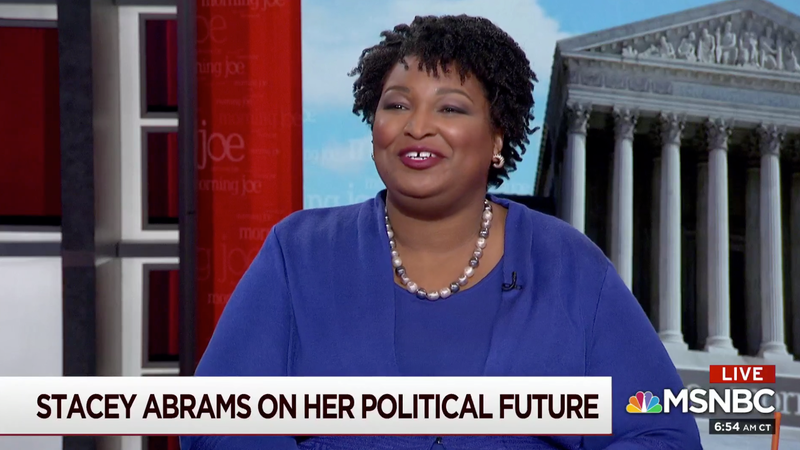 “I don’t think you have to make a decision about the White House before fall, when most people actually start to pay attention,” Abrams said, mercifully. And if we do see Abrams on a 2020 ticket, we can expect her to be a headliner, not a supporting act. Abrams, once again, effectively debunked reports that Joe Biden tapped her as a vice presidential running mate. “I have had conversations with Joe Biden about him running for president, about me running for president, about me running for Senate, about me running for dog catcher,” Abrams said. But she never spoke to him about running as his vice president, and questioned the notion that she’d want that in the first place. Despite everyone from Biden, Senate Minority Leader Chuck Schumer, and even former Senator Claire McCaskill—right there on the Morning Joe panel, before a very patient Abrams—offering their two cents on what her political future should look like, Abrams is maintaining her agency. What we were able to prove in Georgia is that you can center communities of color, you can center disadvantaged communities, and pick up white voters, which is what I did. I increased the white vote share in Georgia for Democrats for the first time in a generation. Because I not only acknowledged the needs of communities of color and marginalized communities, I also acknowledge the needs of white rural voters who needed hospitals and rural broadband. I acknowledged the fact that our water infrastructure is woefully inadequate and we had to do something about that. We have to be able walk, and chew gum, and snap our fingers at the same time. And we have to trust that voters don’t care about someone else having things, they care about us knowing what they need. That strategy could be key to her political ambitions, whatever they are, down the road. Now, that officially appears to be less a question of if, and more of a question of when. Watch the Abrams interview in its entirety here and here.